Adopting the right sales metrics for your business will help you manage sales more effectively and close more deals. In this article, we share the key sales metrics for small businesses, when to use them and for what. We’ll also introduce you to Pipedrive, which makes calculating these key sales metrics easy for any small business to do. What Are Sales Metrics & When To Use them? Sales metrics are ways to measure what is going on within your sales pipeline and help you gain insight into your performance. If you can measure your effectiveness at each stage of the sales process, you are much better placed to manage your sales team and increase bottom-line profits. Given that there are over 300 sales metrics that I am aware of, most small businesses find it difficult to decide on how many to use and which ones. In a small business, if you introduce your sales team to too many sales metrics, they will quickly become confused about what to focus on. They’ll also feel micromanaged, which will eventually impact on their sales performance. Too few sales metrics, however, and you are not able to manage the sales process effectively to maximize your performance. Which Sales Metrics Should I Focus On? While there’s a lot of differing opinions on sales metrics out there, I will recommend a strategy based on experienced that most true sales experts would agree with. I personally favor using a sales pipeline tool like Pipedrive to do this. This is because it provides all of the key metrics that I need without over-complicating the management process with measures that serve to confuse your sales team more than they help improve it. You could adopt more, but in my opinion, these 3 do the job and the rest don’t really add anything unless you have a special need to measure something that is very specific to your business. Most businesses have a strike-zone or sweet-spot in terms of the size of deal that they are most likely to convert. Deals that are much larger in value than this are much less likely to convert and often also represent a bad use of your sales team’s time. A CRM tool like Pipedrive allows you to view the size of each deal in a visual pipeline, like in the example I created below. In the example above, the NetSuite deal is 4x the value of the usual deal sweet-spot, which is $1000 to $3,000. This is the sort of issue that a sales manager would want to address, because it does not sound like a deal is likely to close and it’s inflating the pipeline value by around 50%. A good sales manager will raise this up, discuss it with the salesperson, and 9 times out of 10, the deal is a dud and needs to be removed from the pipeline. The age of an opportunity also a strong indicator of how likely you are to convert it. Another way of saying this is that a lengthy or increasing sales cycle is often the by-product of an unhealthy sales process. Deals that linger or rot in your pipeline for too long are much less likely to convert than deals that maintain momentum at each stage. An easy way to understand this is to identify the average length of time it takes between your first contact with a lead and the moment they close in a successful sale. This is called the average win cycle. If an opportunity exceeds this timescale, this needs to be flagged and reviewed because there is probably a reason for the opportunity stalling at some stage in your sales pipeline. Pipedrive allows you to set the number of days a deal can sit in each stage before raising a flag to let you know that they are starting to rot. See the 2 deals that have turned red in the above diagram. If your win cycle is getting longer, this allows you to quickly identify which stage of the sales process is problematic. Once you know this, you can coach your sales reps to improve their skills and move opportunities through that stage more quickly. You shouldn’t only look at your average sales cycle as a whole; you also need to look at it by sales person. Is one rep closing deals faster than others? Analyze best practices, celebrate them in front of the rest of the team, and use the best practice to improve the performance of the rest of your team. The win rate is the number of leads it takes your business to generate a successful sale. This is an important metric because it is a strong indicator of the “cost” of each successful sale. For instance, the longer you take to close a deal, the more of your sales rep’s time it takes, which is a cost to your business. It’s the aggregate of the conversion rate for each stage in your sales pipeline. As a result, improving the conversion rate has a massive positive impact on your bottom line profits. The next category of metrics we’ll focus on are sales pipeline stage conversion metrics. These allow you to understand the rate at which your sales team is able to progress deals at each stage of your sales pipeline. For example, if I need 100 cold leads to be able to convert 80 qualified sales leads at the next stage, then my conversion rate of cold to qualified leads is 80/100 (or 80%) with 1/4 (or 20%) leaking out of my pipeline. Working out the conversion rate for each stage of your sales pipeline allows you to understand and improve the performance of sales at each stage. A CRM tool like Pipedrive automatically calculates your conversion rate for each stage. It also allows you to analyze this by salesperson. Another reason that conversion metrics are crucial to your business is because they make your sales forecast based on objective measurement, rather than guesswork. No forecasting model is perfect, but understanding your historic conversion rates to forecast what your sales team are likely to achieve in future provides a much more reliable sales forecast and allows you to better manage the flow of cash in your business. If you are concerned by your win rate being too low, the logical next step is to identify the stage (or stages) in your sales pipeline where are opportunities are most frequently stalling and address this. The only way to do this is to analyze your sales pipeline by stage. If you don’t know what these stages are, check out our article What is a Sales Funnel & How to Create One. In the example above from Pipedrive, 29% of all leads are won. The breakdown of where they are lost at each stage tells me I should focus on improving the conversion rate of Proposals Presented as my first priority, as this has the most potential to improve sales performance. Pipedrive will also let you look at the conversion rate by each salesperson, so you can focus on mentoring each team member where they actually need to improve, rather than guessing. Now let’s look at each of the 4 conversion metrics in a 5-stage sales pipeline to understand what typically causes under-performance at each stage and how to address this. A cold lead may have been generated by a marketing activity like an advertisement, an event, or a web form signup. Or a salesperson may have generated it via networking or via a customer referral. Whatever the case, the next stage is for the salesperson to qualify the cold lead into one that fits the criteria that you have set for your business. Does the prospect have a need for our product? Do they have a budget and the authority to spend it? Are they intending to make a purchase in the near future? Usually a sales rep will get the answers they need to these questions by speaking to the customer prospect. The conversion rate to qualified leads can vary widely, depending on whether or not any pre-sales work is done before leads reach your sales team. If you find this rate to be too low, however, you’ll want to scrutinize your lead sources, and check if they accurately represent your customer sweet-spot or target customer. Once the lead has been qualified by the sales rep, the next stage is typically some form of sales demo or pitch to the customer. Depending on the nature of your business, this could take place over the phone, via video conference or face-to-face. Whatever the case, your sales rep presents your product to the customer to help them understand its benefits and the price implications. Often following a demo, the customer will receive a cost proposal. Assuming the sales rep has properly qualified the lead, you would expect at least 80% of your prospects to move to the next stage, ideally move than 90%. This conversion rate will vary according to how competitive your market niche is. The cold lead was not correctly qualified by the sales rep. The sales rep did not follow-up to schedule a demo fast enough. The customer decided to eliminate your product in favour of a competitor’s. Once the demo has been completed and the customer prospect has received a cost proposal, the next stage is to enter price negotiation. Again, depending on the nature of your business, this could take place over the phone, via video conference or face-to-face. Whatever the case, if the customer was not sufficiently impressed by the sales demo or the cost proposal, they will not come back to you to negotiate further. Assuming the sales rep is experienced, the demo is compelling and the product is competitively priced, you would hope to achieve a sales conversion of in excess of 50%, ideally in excess of 70%. This conversion rate will vary according to how competitive your market niche is. The salesperson is not pitching effectively. The product is less attractive or overpriced compared to the other options the customer is considering. The sales rep was too slow to follow-up and/or the customer’s circumstances have changed. Once the price has been agreed verbally, in most businesses, some form of contract will result and a transaction will take place. Assuming the paperwork is what the customer was expecting, the contract will be signed and the transaction will take place. Some of your contract terms are causing your customers a problem. New information was suddenly introduced by the draft contract that came as a nasty surprise to the customer, because the sales rep had not covered these points off during the demo and cost proposal stage. Either of the first to reasons are something that you can fix. You can also ensure that sales reps understand the importance of striking when the iron is hot. When measuring the conversion rate of deals from each stage to the next in your pipeline, you need to know not just the volume of opportunities being converted, but also the monetary value of the opportunities. For example, you may have a conversion rate of 80% of the opportunities from the demo stage to the negotiation stage, but if you are losing all of the higher priced opportunities, you could conceivably be losing over 50% of the value. In my experience, you need a detailed understanding of your pipeline in order to understand the root causes of underperformance. If you are concerned about the conversion rate from demo to negotiation stage, it makes sense to drill down and analyze this further at the rep level. The logical question to ask yourself is, “do all of the reps have a similar conversion rate?” If they do, then maybe the demo materials are weak. But if one rep is achieving a much better conversion rate than the others, it may mean that the other reps need some coaching. It does not matter what business you run: time kills all deals. Knowing this, you should regularly check on any opportunities that are falling outside your normal time range for converting deals at each stage into won deals. What characteristics do won deals display more of than lost deals? This will allow you to try and replicate this behavior to improve the win rate across your team. For instance, won deals may take no more than 10 days to complete 80% of the time which may be worth trying to replicate across all deals. What characteristics do lost deals display more of than won deals? This will allow you to try and eliminate this behavior to improve the win rate across your team. For example, lost deals were all consistently tough to qualify as the customers did not want to offer up all the information we needed. This may lead you to conclude that it is not worth progressing any opportunities that resist proper qualification. Now that you understand the importance of conversion metrics and how to use them to improve conversion rates, and ultimately, your bottom line profits, it’s time to turn to the sales activity that supports the achievement of these conversion rates. It’s worth mentioning that some sales experts simply measure conversion rates and leave sales reps to take responsibility for their own activity. This is particularly true for experienced sales reps who might otherwise feel micro-managed. However, most sales managers would want to understand sales activity and agree expectations across the sales team. This is because the only secret to sales is that there is no secret. Excellent sales results from disciplined hard work and consistently doing all of the right things well. Pipedrive is designed to accommodate the principle that managing sales activities leads to better sales performance. You’ll find this philosophy in the platform’s design that intuitively shows which activity you need to perform in order to achieve a target. The typical activity to measure here is volume of cold calls by each sales rep or whatever method you use to find new leads. If your sales team do not make sufficient cold calls, then you will not generate sufficient cold leads. How many cold colds a salesman makes in a week is often a key activity metric because it feeds the top of the funnel and it’s an unpopular task that under-performing sales reps tend to avoid. If you want your team to outperform, make sure that everyone does some cold-calling, if experienced reps avoid this completely, it makes the less experienced sales reps want to avoid this all the more. It should also make you question how good your senior sales reps really are. The typical activity to measure here is the how fast each cold lead is followed up and qualified. If a customer is looking for a new car service company and you cannot answer the phone in less than three rings, then you do not deserve the business. This harsh reality is increasingly true for all products and services, as customers are becoming more and more resistant to being made to wait for anything. Understanding this can drive a team-wide activity of answering the phone within 3 rings, or calling customers back within 5 minutes of receiving a webform enquiry. The key activity to measure here is that sales leads are converted into demo appointments at the time when they are qualified. The key activity here is to listen to the customer. Then customize your pitch and cost proposal to meet their expectations. You may not be able to alter your product or service, but the sales rep can respond to the benefits the customer values most highly and the concerns that they express. A way to measure whether the sales rep is listening to the customer is to expect them to summarize their understanding of each customer’s preferences and concerns expressed in their notes from demo meetings. The key activity here is to be prepared to negotiate effectively. Most seasoned sales manager’s look to analyze activity closely here to understand the price tipping point at which deals are most likely to be lost to competitors. If you are very price competitive relative to your competitors, you may try to make it easier for your customers to compare you with your competitors on price. If you are not, you may try to redesign your pricing model, so that it’s more difficult for customers to make price comparisons. This metric shows whether revenues generated by your sales team increase or decrease over time and by how much. By analyzing the average sales growth over time, you can also determine how much a business is expanding or contracting. Pipedrive provides you with a simple report to analyze how this changes over time. This is the total number of deals you have in all the stages in your sales pipeline. It sounds simple but the ideal scenario of keeping the top of your sales pipeline full to the brim is challenging for most small businesses. Pipedrive automatically displays total deals and their total value in as part of your regular pipeline dashboard view. It also allows you to use reports to track how this changes over time. Total deals = At all stages of your pipeline at any given point in time. The opposite of conversion rate, this metric tells you how many prospects out of the total number of leads are lost or leak out of your sales pipeline in a given period and at a given stage. The main benefit of tracking your sales pipeline leakage is to gain insight into what stage the leakage occurs and to investigate the root cause and resolve it. Pipedrive provides you with a simple report to analyze deals lost at each stage and also to drill down to individual salesperson reports too. This refers to the average time it takes for a lead to enter the pipeline, go through the sales process and complete the closing stage. The faster you complete the sales cycle, the better. This is an important sales metric for most small businesses, because your profitability automatically improves every time you quicken the process of turning prospects into paying customers. Again, Pipedrive provides a simple report for this metric, it also allows you to set a warning flag so that you are informed when deals start to stall at any given each stage of the pipeline. This article has demonstrated how important it is to use sales metrics to drive your sales pipeline performance and increase your bottom line profits. A charting tool can help you create effective visuals using your metrics. If you want to manage your sales team effectively, it’s important to measure your key sales metrics consistently over time. This will also provide you with a much more accurate way to forecast your sales revenue. Most people use CRM tools to help them with this. 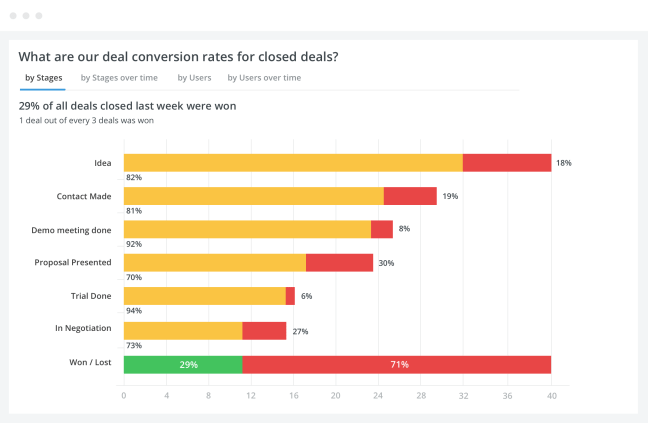 The tool that I recommend for small business in Pipedrive because it’s best suited to measuring the key sales metrics that I have covered in this article, without making things more complicated than they need to be. I just want to express my appreciations for the factual article shared…Amazing!.